Naturepedic Organic Crib MattressNaturepedic Organic Crib Mattress, alt="Naturepedic Organic Crib Mattress, "
Print Designed by a family-owned company in Ohio, this combines top-notch materials with heirloom-quality construction to ensure a safer, sounder sleep for baby. Two sides work together to offer comfort tailored to your little one’s age. On one side, firm padding and a food-safe waterproof surface are ideal for infants and training toddlers. 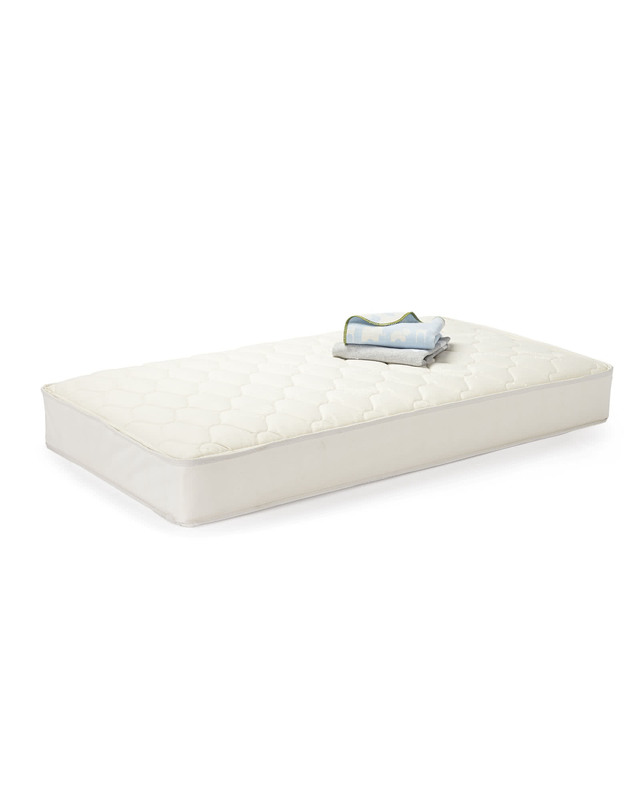 On the other, a soft quilted mattress feels luxurious for fast-growing kiddos. (Pair it with a waterproof cover to protect against accidents and spills.) Crafted by hand, it’s also free from harmful chemicals and allergens. Global Organic Textile Standard (GOTS)-certified organic cotton fabric and fill. Meets UL/GREENGUARD® standards for eliminating chemical emissions. Passes all state and federal flammability standards. Top side features a non-toxic, stain-resistant 100% food-grade polyethylene waterproof cover that’s easy to wipe clean. Bottom side features quilted fabric for extra comfort. Add a waterproof cover (sold separately) to protect against accidents and spills. 252-coil innerspring assembly with 9 gauge edge support, in accordance with the Consumer Product Safety Commission (CPSC)’s recommendations for firmness. Square corners ensure a snug fit. Includes a lifetime limited warranty. 52”L x 27.75”W x 6”D overall.